When I analysed the Let's Brew posts, I noticed that Porter was massively underrepresented. Odd given my obsession with Porter. And its key role in the history of British beer. So, ever in search of some lose thread to tie the recipes together, we've decided to make February Porter Month. Except for last week's. My excuse is that the Tetley's Bitter recipe should have appeared a week earlier, when it was still January. I was really pleased to get my hands on brewing records for regional Porters, like this one from Devenish. Courtesy of Peter Symons. (Thanks Peter.) I've never quite got around to doing much with them. Time to put that right. For those of you not au fait with English geography, the Devenish brewery was in the Southwest. Quite a way from London and pretty provincial. Which makes it perfect for comparing with metropolitan Porters. You can probably guess what's coming - some contextualisation tables. 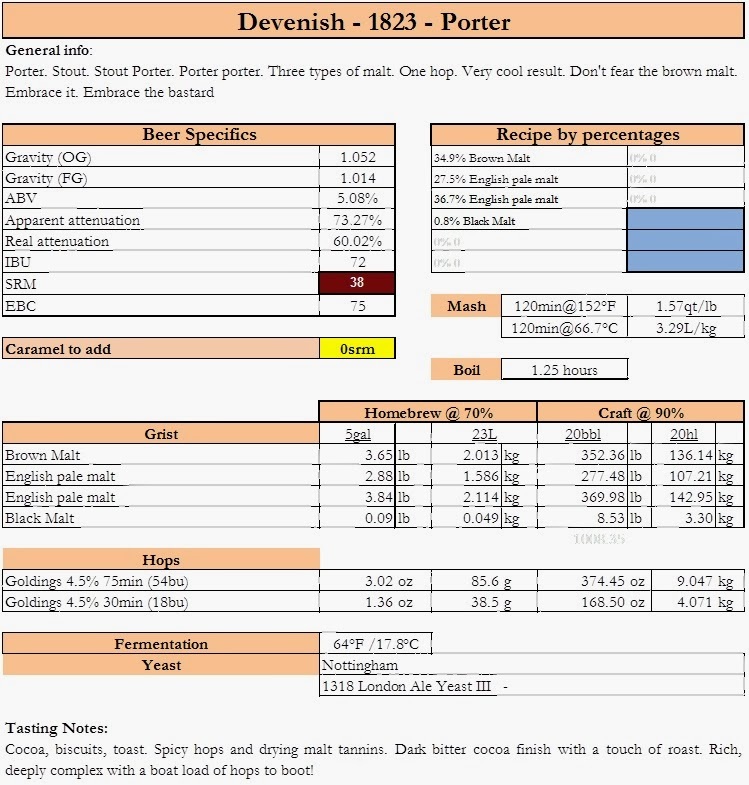 Devenish brewing record, document number Ref D/DEV/BOX97. Barclay Perkins brewing record held at the London Metropolitan Archives, document number ACC/2305/1/531. Whitbread brewing records held at the London Metropolitan Archives, document numbers LMA/4453/D/09/016 and LMA/4453/D/09/018. Truman brewing records held at the London Metropolitan Archives, document numbers B/THB/C/021 and B/THB/C/026. Isn't that fascinating? Devenish Porter was weaker, but more heavily hopped that the London Porters. And pitched at an even higher temperature. And 64-65º F is already pretty hot. I think I know why the London Porters were stronger: they brewed on a much larger scale in more efficient breweries. They could afford to brew a stronger beer and sell it at the same price. The London Porters in the table were had brew lengths of between 489 and 1261 barrels. The Devenish example was just 36.5 barrels. The difference is obvious: Devenish used a much higher proportion of brown malt. Their grist resembles London grists from the period 1805 to 1816: about two thirds pale malt to one third brown. With one difference: it contains a little black malt. Which was only invented in 1817. It looks like Devenish was lagging behind London brewers in terms of grist composition. I think that's enough from me - over to Kristen . . . . . .
Notes: These babies are the cliff notes of logs. Tons of abbreviations. Tons of ‘random’ numbers. Such a cool chore to figure these bastards out. Its like a puzzle…a puzzle that gets you drunk! This is an opportunity to throw caution to the wind and make a recipe you wouldn’t normally. Malt: Four malts. Two pale malts, the standard brown malt and a dash of roast malt. Pick your favs pale but I’d choose to go for some tasty mild malt. Mmmmm…mild malt. To more represent the brown malt of the era, I’d cut it 4 Brown: 1 fancy enzymatic amber or aromatic malt. Hops: A vague ‘Knight’ hops so really feel free to use anything. My guess would be Goldings of some sort but really, be my guest. Yeast: As with all these old recipes, nothing about yeast what so ever. So go nuts. Pick your favorite, I really like the London III for this baby. I am a boring SI Swedish and I don't get no concept of how much hops that is. How should I translate "lbs hops / qtr" to grams per liter? Oh, yikes -- I don't think this one came from us. We sent you a bunch of impenetrable St Austell records, but none from Devenish. hops/qtr doesn't translate into grams per litre, because a quarter is volume measurement of the grain. 1 lb hops/quarter = 2.9 grams per kilo of grain. 1 lb hops/barrel = 2.6 grams per litre. I've fixed that. I was getting all confused.